Dr. Jones is a veterinarian and zoologist by training and has been Director of the North Carolina Zoological Park for 20 years. He was previously CEO of the Zoological Society of London and has spent his entire career, 45 years, in the wildlife and Zoo management field. He has worked in more than 50 countries, mainly in Africa and the Middle East. He has been on the Councils of both World Wildlife Fund U.S. and U.K., was a former Chairman of Fauna and Flora International, the world's oldest conservation organization and has served as Chairman of one of the world's largest international animal welfare organizations, the Brooke. He currently chairs Brooke USA. He is Chairman of Central Park N.C., the principal non-governmental economic development group for the rural counties of central North Carolina. Chairman of the board of the Environmental Defense Fund (North Carolina) and founder/ Chairman of “Wild Welfare,” which seeks to improve animal welfare in zoos needing assistance in their husbandry and management. He has a special interest in the need to make environmental concerns relevant to people's everyday lives and to show the close connection between our environment and economy. Click here to watch a brief video of David describing his 40 years of experience with the Brooke. Dr. Hamilton was born and raised in Indian Hill, Cincinnati, Ohio, and attended Ohio State University before earning his DVM from the University of Georgia. He lives in Southern Pines, North Carolina, where he is a partner in Southern Pines Equine Associates, a two-veterinarian, all-equine hospital focusing on sports medicine. His previous veterinary experience included six years in New York servicing Belmont, Aqueduct and Saratoga racetracks, and three years at an all-equine clinic focusing on rehabilitation. Dr. Hamilton is past Veterinarian of the Year and board member of the North Carolina Veterinary Medical Association; the Founding Chair of the AAEP’s Emergency & Disaster Preparedness Committee; Team Commander of the AVMA’s disaster response team; member of the US Eventing Association’s Safety Committee; member of the US Equestrian Federation’s Safety Committee; Founding Member of the North Carolina State Animal Response Team; and a veterinary delegate to the FEI. Marjorie Rankin is a lifelong resident of Asheboro, North Carolina. She graduated from the University of North Carolina at Greensboro with a degree in Human Environmental Science/Interior Design. She enjoyed a number of years in the practice of Commercial Interior Design, and actively volunteers time to non-profit organizations both in her hometown and around the state of North Carolina. She currently serves on the Boards of Piedmont Land Conservancy, North Carolina Zoological Society and the North Carolina Botanical Garden, each making a difference in the lives of the people, animals and plants of North Carolina and beyond. Being a member of the board for Brooke USA has enriched her understanding of the vitally important relationship between people in the world’s poorest communities and the equines who work so hard with them each day. She has visited some of the Brooke’s programs in the Middle East and has seen the difference it makes to the animals and families who depend on them. John Nicholson was the longest-serving executive director of the Kentucky Horse Park in its 35-year history, and served at its helm during its greatest period of growth – garnering world-wide recognition for the facility, culminating with the park’s hosting of the Alltech FEI World Equestrian Games in 2010. His leadership made the Kentucky Horse Park the ultimate international destination for equine competitors, organizations, and visitors. He also spearheaded the greatest expansion of the National Horse Center in its history, to count among its tenants the US Equestrian Federation, US Dressage Association, US Hunter Jumper Association, and many more equestrian organizations which relocated their headquarters to the park during John’s tenure. He now serves as the Executive Director of the Virginia Horse Center in Lexington, Virginia. Click here to watch John speak at Churchill Downs about the contribution of equines to civilization. Dr. Lunn is Dean of the College of Veterinary Medicine at North Carolina State University. Previously he was a Professor and the Head of the Department of Clinical Sciences at the College of Veterinary Medicine and Biomedical Sciences at Colorado State University. Before moving to Colorado, Dr. Lunn was Associate Dean for Clinical Affairs and Director of the Teaching Hospital at the School of Veterinary Medicine, University of Wisconsin-Madison. Dr. Lunn hails from Wales, where he grew up in a farming community, before studying veterinary medicine at Liverpool University. After a period in private practice in the UK, he pursued clinical training in Wisconsin, and doctoral research training at the University of Cambridge. Dr. Lunn’s research interests are in equine immunology and infectious disease, and most recently he has focused his work on infectious diseases of working horses and donkeys in low income countries. 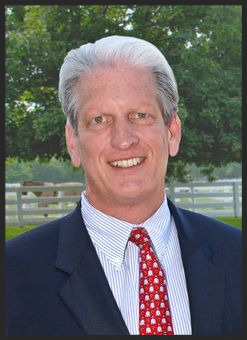 Jim Wolf worked for more than 20 years for the United States Equestrian Team (USET) and United States Equestrian Federation (USEF) in various roles including Director of Eventing, Special Assistant to the Executive Director and ultimately as the Executive Director of Sports Programs at USEF. He was the Chef d'Mission for the US Equestrian Team at every Pan American Games, World Equestrian Games and Olympic Games from 1996 - 2014 overseeing the fielding, funding, equipping and selection of all of the US Equestrian Teams at these championships. Before joining the USEF/USET full-time, Wolf was the manager of the three-day eventing team at the 1992 Olympic Games in Barcelona. He was also an eventing competitor, fox hunter, farm manager and logistics coordinator for the international transportation of horses and equipment. He owns Wolf Sports Group LLC, which provides services and consulting in sports marketing and event planning and management. The company focuses in all sports-related areas, but primarily in the equestrian disciplines. Jim is one of the primary organizers of the Rolex Central Park Horse Show and the Asheville Regional Airport Eventing Showcase in Wellington, FL. He consults with the Bellissimo group of companies in the areas of sponsorship and business development. Wolf continues to work with the USEF as a consultant and is involved in the organization of the Rolex Kentucky Three-Day Event. She works in partnership with her husband, Mark, for the Wellington Equestrian Partners, the guiding entity for Palm Beach International Equestrian Center show grounds operations and development. Katherine is a principal in the Tryon Equestrian Partners, which oversees the Tryon International Equestrian Center and Tryon Resort in Tryon, NC, as well as the Colorado Equestrian Partners, which manages the Colorado Horse Park in Parker, CO. For all three venues, Katherine oversees all sponsorship, marketing, communications, retail operations, and vendors. Katherine, her family, and the Wellington Equestrian Partners continue to grow the Great Charity Challenge (GCC) initiative. The GCC celebrated its sixth year as one of the state’s largest charitable giveaways in a single day and has donated more than $9.2 million to more than 197 Palm Beach County charities. In addition, the Bellissimo family purchased The Chronicle of the Horse, one of the country's oldest equestrian publications based in Middleburg, VA. Katherine is also the publisher of The Chronicle of the Horse Untacked, the award-winning bi-monthly equestrian lifestyle publication unveiled in December 2013. Marcia Kulak is a top 3-day event rider and trainer based in Scotia, New York and Wellington, Florida. As an international rider for 25 years, she has successfully competed on the world's biggest stages: Rolex Kentucky, Burghley, Blenheim, Boekelo and Fair Hill. In addition, she has been short listed for two Olympics games. Her extensive back ground and education with top trainers, including Jack LeGoff, George Morris, Anne Kursinski, Ruth Poulsen and Sue Blinks along with using Natural horsemanship techniques in her training program, gives Marcia a unique and far reaching approach to horsemanship. Her winter base in Wellington, Florida has allowed Marcia to expand her operation to include jumpers and hunters as well as top eventers. Her riders have excelled at the highest levels, including WEF, Lake Placid, Devon, and Capital Challenge. She currently trains several of the Area 1's leading junior and amateur eventers. Marcia is best known for her classical and empathetic riding style as well as the meticulous care, management, and presentation of her horses. In addition to her thriving equestrian business, Marcia currently serves on the USEF 3-Day Eventing Selection Committee. "I am truly honored and humbled to serve on the Brooke USA Board of Directors. We bring together an equestrian community with extraordinary vision and vast resources to an organization whose core values are very much in line with my own. A para-vet trained by the Brooke in India uses his skills to examine a working horse in his community.